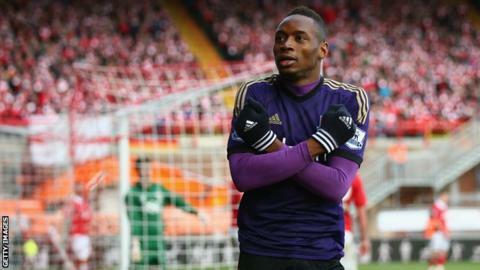 West Ham "set a dangerous precedent" by playing striker Diafra Sakho at the weekend, according to Senegal national coach Alain Giresse. Sakho, 25, withdrew from Senegal's Africa Cup of Nations squad earlier this month because of a back injury, but played for the Hammers on Sunday. "When you cannot fly for six weeks and then suddenly you're playing a football game, there must be miraculous medicine in England," said Giresse. "I'm surprised to learn he played." Sakho had been selected in his country's 23-man squad before withdrawing ahead of the tournament, which began on 17 January. Senegal wanted to assess their player, but was told he could not fly because of his injury. However, Sakho came on in the 57th minute of West Ham's FA Cup fourth-round tie at League One side Bristol City and scored the only goal. "This sets a dangerous precedent because you're going to have players claiming they cannot catch planes to Africa but who can still play football," added Giresse. Hammers boss Sam Allardyce has defended his decision to pick Sakho, and insisted he was unable to fly. "We had to drive him down in a limo on Saturday but other than that he said he can get out on the pitch and just see how he goes," Allardyce told Talksport. Speaking on Sunday, Sakho said he had been "saddened" and "angered" by criticism of his absence from the tournament. Senegal have beaten Ghana 2-1 and drew 1-1 with South Africa in the Africa Cup of Nations and will qualify for the quarter-finals if they avoid a defeat against Algeria on Tuesday.